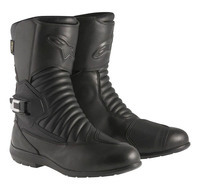 This new Mono Fuse Gore-Tex boot is a new “mid-rise” boot from Alpinestars for 2015. The use of Gore-Tex as the waterproof liner, and the use of real leather for the upper material make this boot a top of the line choice. Gore-Tex as the waterproofing technology (which is HIGHLY regarded) doesn’t come cheap of course, but these boots are priced consistently with the slightly taller Web Gore-Tex boots, and other brands’ models with similar construction (such as TCX Gore-Tex street boots). Also, like the other high-end street boots, these have the usual protective features for street and touring…shin, heel and toe reinforcements, and those along with the thick leather, feel like they’d hold up very well long-term. The boots have some integral padding over the inside ankle and the molded plastic buckle on the outside of the ankle provides impact protection for that side of the foot. New for this year is the CE certification (see more about that below). The back of the boot has a bright reflective patch for nighttime visibility. You can take the “View Larger Pictures” link above to see closeups of this boot’s features. The one thing that IS different about this boot over many others is the unique closure style. If you take a look at our photo gallery, you’ll see the ratchet buckle on the outside ankle area and the Velcro close on the inside. The overall look is really unique, and it works well, but putting the boots on and taking them off requires that you work with the ratchet buckle mechanism each time (it is not a “set it and forget it” type adjuster). It’s not a big deal, but it isn’t as easy as the “usual” side zip/velcro closure, particularly since the buckle strap goes around the back of the foot and engages on the outside of the foot. If you are trim and limber, it’s no big deal, but you couldn’t describe me that way and it is a bit of an effort to put them on and take them off. Personally, I’d opt for the Web Gore-Tex or the New Land Gore-Tex closure set-up, but that’s just me.